on Saturday 15th 2016 October 2:49 PM. Thank you to those of you that suggested this change. We hope you find the changes useful. As always let us know if you would like us to make any changes to VegPlotter. Get in touch on any of the social media platforms or using our Contact Us Form. on Thursday 17th 2016 March 12:19 AM. 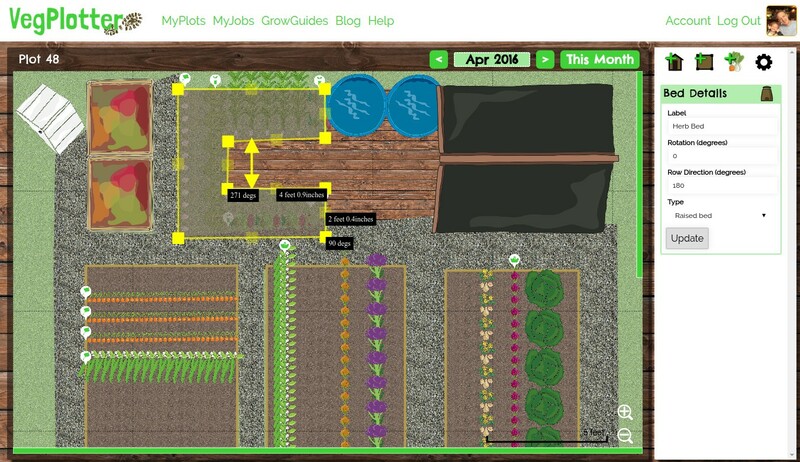 Since we launched in January we have had an amazing take up of our vegetable garden planner. This exceeded all our expectations. Thank you to all. We also received incredible feedback and can see that it is being used to good affect. Thank you to all those that wrote to thank us. We love to hear from you and how you are using VegPlotter. Give option to move plants without extending them to the bed boundary: You can now switch between two plant modes: 'Flow' and 'Fixed'. You can switch between modes by double clicking the plant / row. Plants in 'Flow' mode will extended to the bed boundaries or up to other plants if in the way. Plants in this mode have yellow drag handles (see screenshot). Plants in 'Fixed' mode will not extend and will maintain the row length if there is enough space in the bed. They will also maintain their orientation, even when moving between beds. Plants in this mode have blue drag handles (see screenshot). Make trees single plants: Now when you drag a tree on to the plot it places a single tree only. If you do want a full row of trees double click/tap the base of the tree to turn it to 'Flow' mode or drag out the handles. Allow for custom plant spacings: This was requested by a few of you and we could not deny you all :). So you can now alter the spacings for any plant on your plot. Select the plant and change the spacing using the options in the Plant Details menu on the right (see Screenshot). We've included fields to set the spacing between and in (along) the row. We hope you like the changes released in this new version. If you sent us suggestions that weren't included. Thank you, we have not forgotten and are working on including as many as possible in our next release. If you have any other suggestions we love to here from you. You can contact us using the Contact us form or Suggestion box at the bottom of each page if logged in. on Saturday 23rd 2016 January 12:23 AM. We have made a major change to VegPlotter. From today our planning tool will be free to all non commercial users. That gives you access to ALL the features of VegPlotter's unique vegetable garden and allotment planning tool for free. 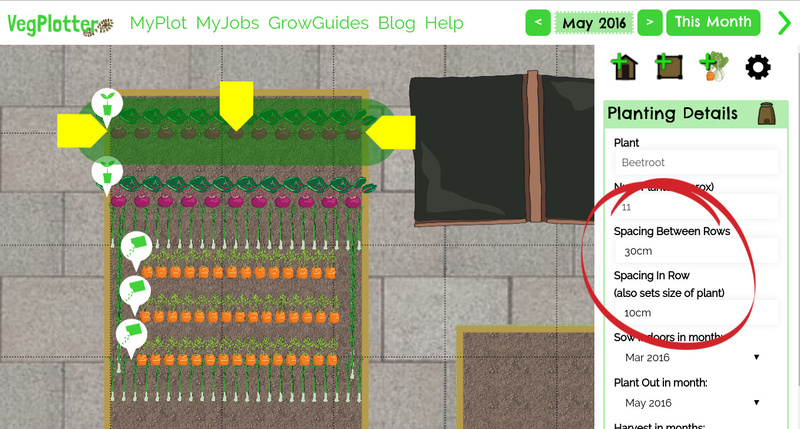 Added the ability to alter the planting schedules for plants on your plots. Improvements to the algorithms that tailor the planting schedules to you your local climate. Increased the plot area on mobile devices (so you can see more of your plot on your phone / tablet). VegPlotter provides a unique and useful facility that makes planning and managing any vegetable patch / kitchen garden or allotment simpler. We know it can help people to grow their own food, whether beginner or seasoned allotment holder. We hope you will enjoy your new freedom to plan away. P.s. We would love to hear from you and would welcome any feedback / suggestions. Please use the suggestions box below or contact us here or through our social media channels.